Floral transition which initiates bolting and flowering is induced in flowering plants by environmental factors such as low temperature and photoperiod and by endogenous factors such as growing stage and Phytohormone. The molecular mechanism in the floral transition has attracted considerable interest, and, in particular, agronomic application by genetic and physiological control of bolting and flowering times has been the subject of many researchers and breeders seeking to develop cultivars efficiently. Study of the floral transition has been remarkably advanced in Arabidopsis thaliana as a model plant using a variety of genomic resources such as various ecotypes and information on genome sequences and mutant lines. Four major flowering pathways in Arabidopsis have been found, and gene networks in these pathways have been revealed in the past about 20 years. Based on studies in Arabidopsis, genetic studies on bolting and flowering times have been conducted in Brassica species such as Brassica rapa and Brassica oleracea. 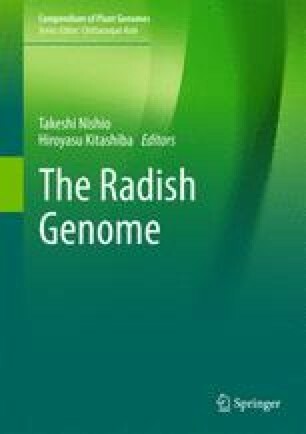 Following these studies, high-density genetic maps and genome sequences have been recently published in radish (Raphanus sativus L.), and several studies to identify genetic factors or loci associated with bolting and flowering times have also been attempted. Here, we review genetic studies on bolting and flowering in Arabidopsis and Brassica species and then introduce recent studies in radish together with results of our current attempts.